Great Non-toxic way of catching Rodents and insects. The glue covered surface measures 4.5"x 6.5" (the whole trap is 5.25"x 7.75") Can be used as flat or folded and placed where rodent or other target pests activities have been observed. Set of 12 Trap Board NON-TOXIC Great to use where pesticide can not be used. 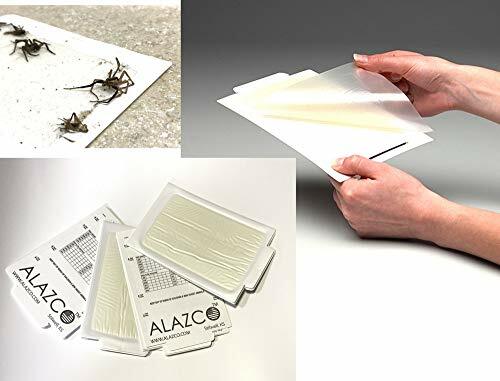 ALAZCO Glue Traps use an exclusive glue formula that has been continually tested to ensure the best holding power resulting in the highest success rate! Depending on what you are trying to catch, it can be used either flat or folded up into a covered trap. The easy-to-remove release paper saves time, providing the fastest, easiest set up times compared to other peel-off glue boards. Great Non-toxic way of catching Rodents and insects. Can be used as flat or folded and placed where rodent or other target pests activities have been observed. NON-TOXIC Perfect Pest control for places where pesticide can not be used.